Taipei native, RayRay, like all great artists, manifests this into her music. At a young age, she dug into the rich history of music and born out an eclectic taste and a sensibility of soulful sound, when she digs in the crates and drops the needle, she drops gems. 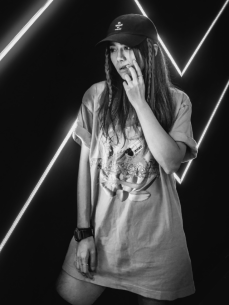 She's been a hit in the circuit of major music festivals and DJ venues across Asia, working with some of their top music makers. Catching the ears of the crowd in her home country, she was crowned champion of the 2013 Red Bull Thre3style DJ competition. The same year, she represented Taiwan in Toronto for the International DJ Championships. With so much strength under her belt, she's garnered further foreign interest, being invited to perform at SXSW in 2013 and 2016, ADE in Amsterdam 2015, Glastonbury UK Festival in 2016, and the Midem France Music Festival in 2016. Each year, her reach furthers. The collective did not just immerse into her music talents, they even interested themselves to the method of her madness, inviting her to present and speak her ideas of music and life for TEDx Talksand also Google Talks. The mad creativity runs deep to the soul of our artist, creating her other musical alter ego, producer, WiFi Grapes.